OTR portable chillers- for applications requiring both heating & cooling. Industries & Applications: Aerospace and Defense, Digital Printing, Food and Beverage, Mobile Imaging, Plastics, Photonics, Research, and Semi-Conductor. Our portable chillers feature easy to use standardized control components which are time tested and widely available throughout the global marketplace to create a system engineered for years of reliable service. 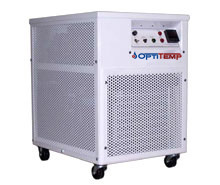 OptiTemp portable chillers feature a full one-year parts and labor warranty.